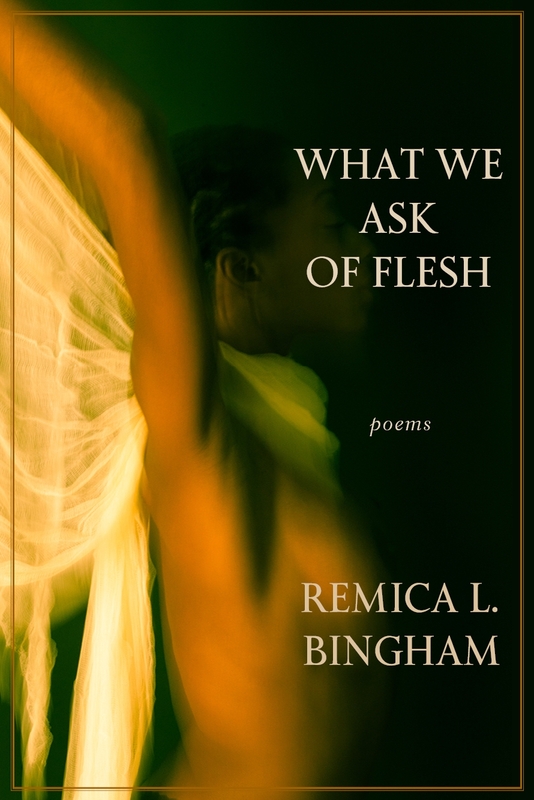 About three weeks ago, I received a review copy of Remica Bingham’s What We Ask of Flesh; however, given the constraints of time, I was not able to read the book until my school’s holiday break. What a treasure! First of all, let me say Bingham exhibits an effortless language while confronting issues of womanhood coupled with spirituality and religion, which Bingham queries in fresh and neoteric ways, presenting myriad scenarios/situations, allowing the reader to process the information howsoever she chooses. The female body becomes instrument/foci, a way of navigating What We Ask of Flesh. As Patricia Smith notes in her amazing introduction, “Her voice rises, sole and singular, above the fray as she conjures a soundtrack for the wife, the mother, the sister, the daughter, the colored girl who has quietly preserved while resisting attempts to change her beliefs, her history…” Perhaps the idea of an “everywoman’ is more adequate with these poems as they mirror the “ever forming” [body]. “The Body Speaks,” which is a long poem in various aesthetic movements, appears first in the collection, echoing Smith’s observation perfectly, as Bingham begins to lay a foundation around the body. The body, for Bingham, acts both as literal and metaphorical. The epigraph connected to the poem is biblical and is taken from Judges 19:29, 30. The premise of the epigraph centers on a woman taken as concubine by a male conqueror, and when they are lodged for the night in a foreign land, the woman is taken out of the house and ravaged/raped by local male villagers. Her owner/conqueror receives the woman back in the morning “damaged,” and when he gets her home, he cuts her body up according to her bones into twelve pieces, sending the bones out into the land of Israel. What’s interesting in Bingham’s poem is her analogous comparison to the fragmentary as part of something parenthetical, as in (us), as if these parts of the woman are representative of a collective body. She writes, “torches/by being sole/points of light/become stars/in the process of being broken/this sum becomes every broken body.” For Bingham the fragmentary functions as foundation for the whole, and the body (literal and metaphorical) operates from a point of language rooted in the traumatic—the echo of the unremembered. If we can agree violence is at that core of (us), perhaps through dichotomy/dualisms’ friction, then we have to acknowledge language, in all its contradiction, transmits this violence. I would like to think this is the fragmentary that is woman, a subset (along with man) of (us), multiple bodies forming the [self), a sort of aesthetic/human freedom. What We Ask of Flesh explores these possibilities along with many others. This is the gift for the upcoming holidays that will keep on giving.